The downturn in the world economy following the global banking crisis has left the Chinese economy relatively unscathed. 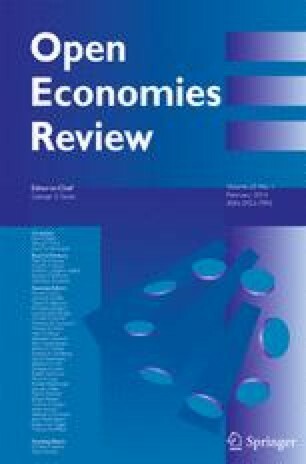 This paper develops a model of the Chinese economy using a DSGE framework with a banking sector to shed light on this episode. It differs from other applications in the use of indirect inference procedure to test the fitted model. The model finds that the main shocks hitting China in the crisis were international and that domestic banking shocks were unimportant. However, directed bank lending and direct government spending was used to supplement monetary policy to aggressively offset shocks to demand. The model finds that government expenditure feedback reduces the frequency of a business cycle crisis but that any feedback effect on investment creates excess capacity and instability in output. We thank Yi Wang for her assistance with collecting Chinese data. This paper was prepared for the 2013 Konstanz Seminar on Monetary Theory and Policy. Zhiguo Xiao acknowledges the support of the National Science Foundation of China (Grant #11001059 and 11171074). We thank, without implication Haizhou Huang and other partcipants of the 2013 Konstanz Seminar and members of the La Pour-Societe of Fudan University for helpful comments. In this appendix we show how the model, given that it jointly predicts (within 95 % bounds) the VAR coefficients that determine the IRFs of shocks on the three key macro variables, thereby also broadly predicts these IRFs. Because the Wald test is of the joint behaviour of the VAR coefficients and on the variances of the three variable residuals, there is not a perfect correspondence with the individual IRFs. However, it can be seen, as expected, that most of the IRFs lie mostly within the bounds. It is the IRFs that policymakers are interested in, as pointed out by Christiano et al. (2005). They need to be assured that empirically the IRFs the model implies should appear in the data actually do so within statistical bounds (of course the IRFs implied for data behaviour reflect both the model structural IRFs and sample shock variations). Then they feel able to use the model’s (structural) IRFs to determine the effect of shocks and of policies to offset shocks. The VAR innovations are identified throughout by the model; we have no independent way of identifying the VAR innovations (any such ways suggested are based on some ‘non-controversial’ model restrictions; however, the model here is non-controversial in its current innovation structure and so we use it.) The testing kicks in on the variances of the VAR innovations and on the lagged effects of each variable (the VAR coefficients).